If you need a cocktail with a big dose of "get up and go" the Espresso Martini will tick your boxes. It's deceptively sweet but the Vodka, Kahlua and caffeine all pack a punch that will keep you going into the night. Place sugar in TM bowl. Blitz 10 sec/Speed 9. Add the remaining ingredients to the sugar. Blitz until smooth on Speed 9. 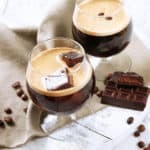 Below is a recipe for just one serve of Espresso Martini.